While Kate Bush is a national treasure in the UK, US listeners don't know her so well. The following 12 songs capture her irrepressible spirit. Last month, Kate Bush's return to the stage at London's Hammersmith Apollo for the first time in 35 years was a long-awaited event, to put it mildly. Since her first pirouette onto the music scene in 1978 when she was only 19, Bush has astonished and fascinated her listeners. She is an enigma -- a Mother Nature-like figure spinning in leotards or dancing in kaftans while singing in a voice that has made her an icon. Bush not only has a cult-like following of dedicated fans, she is a musician's musician. Coinciding with her live show, the BBC released a documentary titled Running Up That Hill, which aired late last month. In the film, an impressive list of musicians including David Gilmore, Peter Gabriel, John Lydon, Elton John, Tricky, and Tori Amos sing Bush's accolades and discuss how she has influenced their music. Even writers chime in: Neil Gaiman calls her voice "absolutely otherworldly", and author Katherine Angle describes her style aptly when she observes that Bush not only stretches out her voice but also stretches "the pop form". In short, Bush is unlike any other artist. Listening to her is a transformative experience. She has the ability to take her listeners and transport them to far away places, from the windy moors of Yorkshire to a bloody battlefield. Bush has taken bits of classical, traditional Celtic, prog rock, and tribal music and woven them together to make her own unique sound. Perhaps Elton John says it best when he observes: "When has the next Kate Bush come along after Kate Bush? There hasn't been one." While she's a national treasure in the UK, many in the US have heard of Kate Bush but don't know her. In order to introduce someone to Bush, it is better to play them her music than try to describe it. The following 12 songs are meant to capture the spirit of Kate Bush, and hopefully attract new fans. 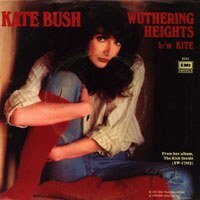 Bush's first hit single, "Wuthering Heights" is an ode to the famous novel of the same name by Emily Brontë. In the BBC documentary, Bush said she got the idea for the song while catching the last five minutes of the 1967 TV series based on the book, in which the ghost of Catherine Earnshaw stood outside the window of Wuthering Heights, begging to be let in. Bush then read the novel to capture the mood of the song. Her efforts, after reportedly only a few hours of writing, earned her a number one hit that stayed at the top of the British charts for almost a month during the spring of 1978. The song takes quotes directly from the novel, including "It's me, I'm so cold", and is the first Bush tune to make references to literature, which she does again on later albums. Bush's haunting vocals float over the twinkling piano and a guitar solo by Ian Bairnson (who worked with Alan Parsons), making the song a splendid example of Bush's sonic wizardry. The first track on 1978's The Kick Inside, "Moving" is a one of Bush's most gorgeous songs. Like many of Bush's songs, it makes use of sound samples. In this case, the song opens with a a whale song, giving it an almost cold, oceanic air. But once her voice comes in, sliding between octaves like "moving liquid", the song takes on a warmer quality. Bush penned the tune for her mime instructor, Lindsay Kemp, who also worked with David Bowie during his Ziggy Stardust period. In the BBC documentary, Kemp says he was surprised to find the record slid under his door one day and finding that the song was dedicated to him. He confesses he never knew she sang because she was so shy. He also revealed that once he was able to bring Bush out of her shell, she was a "wild thing". The song was only ever released as a single in Japan, but remains a beloved staple in the Kate Bush catalog. Nobody does drama like Kate Bush. "Wow" from her 1978 album Lionheart attests to this. The song is literally about drama and the daily grind of the acting world. In 1979, Bush told her fan club magazine the tune is about "show business in general". Bush is a bit of thespian herself, dressing up and playing her characters in her videos. 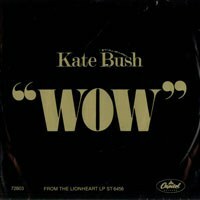 The video for "Wow" is a montage of her performances captured during her 1979 "Tour of Life", the only concert tour Bush ever headed before last month's performances. The song is self-referential, foreshadowing Bush's fear of the stage. When she sings the words "wow" and "unbelievable", it's a complete musical experience in itself, making one wish she would tour more. In her earlier years, Kate Bush tended to sing from the point of view of someone other than herself. On the first single from her 1980 album Never for Ever, she sings from the point of view of a fetus worried about the prospect of a nuclear war. The song's message is two-fold, addressing the reliance of a baby on its mother's womb as well as how vulnerable the rest of us are against those with the power to drop a nuclear bomb. Neil Gaiman called the song "utterly political and utterly female". When Bush sings about chips of plutonium "twinkling in every lung" accompanied by the flickering sound of a triangle or synth note, it becomes apparent how lovely Bush can make something sound despite how dark the lyrics are. In the last three quarters of the song, Bush's voice fades out and is replaced by the recording of a man describing how a mushroom cloud is created. As he describes the flash "far more dazzling than any light on earth -- brighter even than the sun itself", a group of male voices (including Roy Harper's) come in, singing: "What are we going to do without? We are all going to die without". Soon after, all hell erupts with heavy guitar, the men singing louder, and Bush's voice erupting, "Oh, God, please leave us something to breathe!" The song ends with an abrupt whoosh that seems to swallow the whole song the way a nuclear bomb would consume the area it lands in, delivering an impeccable musical onomatopoeia. The last song on Bush's fourth studio album, The Dreaming was partially inspired by Stephen King's The Shining according to Bush in an 1982 interview with Melody Maker. The book aside, the song is the perfect example of why we love Kate Bush so much. "Get Out of My House" is incredibly wacky and riotous, making brilliant use of Bush's vocal calisthenics. She switches from the sound of a hysterical woman locking up her house to a contemplative woman singing, "I wash the panes, I clean the stains" before she conjures a hauty concierge singing, "Honey won't let ya in for love, nor money". This is all prior to negotiating with a male who appeals: "Woman let me in. Let me bring in the devil dreams." Eventually Bush imitates a mule braying with a robust "hee haaaw" that develops into a male sing along and then into an indecipherable chant. Amid all the madness is nothing more than a drum machine, a slamming door, and an occasional secluded piano note, The vocals are so robust, it is hard to believe there is so little music, which just goes to show how much Bush can do with merely her voice and her madcap imagination. Amid the brilliant lunacy of The Dreaming, "All the Love" is a quiet treasure. The song is a reminder to stay connected to those we love, even when we are at odds with them, since we never know when tragedy may strike. The song's narrator is ignoring her own advice, waiting for her friends to contact her. The lines "So now when they ring, I get my machine to let them in" capture the disconnection between humans amid an era of modern technology. Back when the song was written, it was the telephone that could bring people together and the answering machine that could serve as a barrier between them. Bush's own malfunctioning answering machine with a series of touching "good byes" from various friends is played near the end of the song while a choirboy sings, "We needed you to love us, too." In a time when texting has replaced the phone, becoming the foremost means of communication and alienation, the song is just as relevant and poignant today as it was in 1982.